Lampedusa. It happened again. I had hoped it wouldn’t, but it did. That is how life is. The things you wish to banish into a dark deep room and throw the keys away have a way of popping up. Uninvited, forceful. First it was ten bodies, and then ninety-three and the last time I checked, the figure had shot up to two hundred. No one knows how many more are stuck at the back of the sea or have been eaten up by some hungry sea animal. These faceless and nameless sons, daughters, fathers, mothers like many before them have become statistics. The last time I checked, their lifeless bodies lay there spread out for the world to see. Thankfully, they were in coffins. Nice coffins. I am grateful for that. You see, it is one thing to die in strange waters but to die and lie naked for the world to see is a real bad calamity. I know this, I’m African and dignity means a lot to us. I don’t know how often I have avoided writing about Lampedusa. As an African in Europe, Lampedusa is not just tragic, it is humiliating. It is a reminder of the abundant wealth in Africa. It is a reminder of the paralyzing poverty. It is a reminder of a type of leadership that strips its subjects of any trace of dignity. It is a reminder of an elite that has just about enough to buy half of the world but not enough to provide the basics for their subjects. It is a reminder that the celebrated prosperity in the continent of my forefathers is firmly in the hands of a select few. But most of all, it is a reminder that Africans are an unwanted lot on this side of the Mediterranean. “Don’t they know the dangers mummy?” my eight year old whimpers in my direction her mouth agape, her fingers lightly covering her mouth. I stare helplessly and for some reason I don’t find the right words. What words can aptly describe the hopelessness that make one board a boat knowing that the chances that they will die on the way are higher than the chances that they will survive? What words can fittingly explain the indignity of choosing death over a place you call home? But it doesn’t end there. Later in the evening, I turn on the TV. It is the usual hullaballoo that accompanies the never ending Lampedusa tragedies. Just like the previous countless times, there are two distinct sides but I somehow can’t tell the difference. “We have to do a better job of closing the borders,” the first speaker starts. He like the other panelists is some kind of an expert. An expert on Africans. “And deport those who survive to stop the rest from coming!” He continues clasping his hands. The second speaker throws him a harsh glance. “That can’t be the solution. Europe is a civilized continent.” He starts. “We have to help the vulnerable.” He pauses to look at his fellow panelists. There is an uncomfortable silence. The first speaker clears his throat. He is not taking this lying down. “We don’t have the space and the resources to take in all Africans!” He shouts back. All Africans? I hear myself protesting. I actually think he meant to say it calmly. The discussion goes on. Typical Germans, analyzing everything. It is now an hour since the discussion started. I watch the weary eyes. The voices are no longer forceful. Both sides have had an aha moment. There will be another Lampedusa. And there is absolutely nothing they can do about it. Very good piece! This is sad and unfortunate. 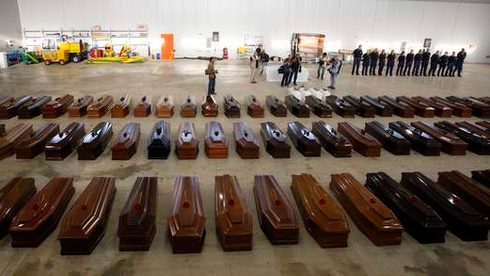 It is not just Africans who are dying at Lampedusa. There are many from Afganistan, Syria and all those hot spots in the middle East. @Jan, thanks for stopping by! You are right. It is not just Africans but somehow whenever I hear people talk about Lampedusa, the focus is always on Africans. @Dern thanks for your comments. I hear you, I really do. Caroline, I would like to commend you for your writing. You write SO WELL. It is not easy to bring out emotions, you did that and much more in this article. Secondly I have a question that I hope isn’t insensitive. Is it true that those who can afford to pay ‘merchants’ to ship them via Lampedusa are in fact the rich ones? To your question; I have heard stories of people paying thousands of Euros for their passage into Europe. I’m not sure that you can call such people rich. I think they are more driven by desperation than anything. Most of the time, the money is borrowed with the hope that they will be able to pay back once they are safely in Europe.